FCS stock a selection of Formula Ford cars detailed below. If the car you are looking for is not here, please give us a call and we will see if we can find it for you. FORD PINTO ENGINE. F/F 2000 - Sports 2000 Engine. Dismantled assy complete with Steel Dry Sump , Block with crank , rods and pistons etc . Cylinder head assy with valves and camshaft. rocker cover , Carb and Manifold. No oil pump , front cover , flywheel and clutch. Sold as seen , buyer collects. Sensible offers invited. Alan Cornock ; [email protected] . ALEXIS MK15 Formula Ford. 1968 car Chassis No AM59 and supplied with HSCC Identity Documents. This car is complete with Broster tuned engine , MK8 Hewland gearbox , Spax shocks etc. Very clean attractive car running on the button and eligible for HSCC Historic Formula Ford series, Class B BARC and French Historic events. With an interesting documented history it has been in possession of the current owner for past 10 years during which he has competed in very few events but stored and maintained the car to a very high standard. Two extra wheels and tyres plus alternative gear ratios are included in the package. This represents a very cost effective easy to maintain race car for use in Historic Racing. Photo To Follow. CHEVRON B17 Formula 3 . 1970 1 litre " screamer ". This car is chassis number F3-70-8 and has full documented proven history. It is offered in SHOWROOM condition having been rebuilt into a new chassis and with a re-built Hewland MK8 gearbox with new 7/31 CWP.plus many other new or refurbished components. Available less engine but with fitting kit and new exhaust system. Original chassis with Chevron chassis number is supplied with the car to add to it's provenance. FIA Papers applied for. Package also includes original Formula Atlantic engine mounts and set of Atlantic Mag wheels This car is owned by John Bright whose restoration skills and attention to detail are world renown and has been brought to me to sell on his behalf due to pressure of work. Available for inspection in my premises in Cambridgeshire by appointment. Asking price is now Reduced as Funds Required for a New Project Now Asking £ 37,000 or part exchange for Historic/Classic single seaters, Finance available if required , export arranged to any part of the world. Alan Cornock : e-mail [email protected] , Phone 01480 860020 , Mobile 07860 954238. HEWLAND LD200 GEARBOX'S I now have in stock a batch of used Hewland LD200 Gearbox's. These are all late spec. case models which were fitted into Mygale Duratec cars but now superseded by Sequential FTR model. All very clean and fitted with a variety of CWP and Ratio's. ANY INSPECTION INVITED. Suitable for a variety of uses including late spec Kent Formula Fords. Will sell as individual box's or as a job lot. Prices from £ 2995 each. ROYALE RP26/27 A Kit of parts comprising off. Chassis , suspension beams , pedals , gearshift , oil tank , steering rack , gearbox casing , rear uprights and hubs , cockpit section , side pods , Ideal spares package or basis to build F/F1600 or F/F2000 car. ROYALE RP26 F/F 1600 KENT Classic Formula Ford Designed by Pat Symonds and built in 1979. This is the sister car to one currently being raced successfully by Rick Morris in BARC series. Car is complete with Minister Engine, MK9 Hewland, Bilsitne Shocks and in ORIGINAL specification with no out of period mods. ROYALE Chassis Plate, Known History , and Log Book. We can still supply spares for these cars including body panels to replicate famous successfull models of the era. Car can also be easily upgraded to RP27 F/F 2000 spec for HSCC Historic Series. VAN DIEMEN RF96 ZETEC.. Complete car with Engine and Hewland LD200 Gearbox, Madin 3 Piece Wheels plus Extra Set with Wets and Front and Rear with Slicks. Ohlins adjustable shocks ( remote reservoir ) Clean Tidy Car , running on the button. Stored properly and very little use over last few years. Even has a tailor made car cover. Super Value car for 750 MC , Sprint , Hillclimb, Track Testing etc. Sensible offers considered. ROYALE RP3 Formula Ford Kent. 1970 car which I was personally involved with when first built and can still supply spares. This car is complete with " Scholar " engine, Mk9 Hewland gearbox ( running to MK8 spec ), Spax adjustable shocks , Stainless Steel exhaust etc. it has been well restored to original specification and is running on the button. The car has FIA Papers , Log Book etc. and has been in the current owners possession for the past 10 years during which it has only competed in a limited number of Sprint events. A very clean genuine car eligible for HSCC Historic F/F Championship , Class B of BARC Classic F/F series plus several European Championships. Must be seen to be appreciated , cheaper than a Merlyn and can only increase in value. FINANCE AVAILABLE ON THIS PARTICULAR CAR. ROYALE RP24 Formula Ford 1600cc Kent. Complete car built in 1978 with chassis number and known guaranteed history. Fitted with Minister Engine , MK9 Hewland Gearbox , Bilstine Shocks etc. Original spec car which has undergone a sympathetic rebuild and not been used since. This was my own personal car used for displays and exhibitions only , now eligible for BARC Classic series plus European events. Fitted with latest regulation silencer and seat belts. A chance to own one of Rory Byrne's classic designs which brought success to Kenny Acheson , Trevor Van Rooyen , David Leslie and many other drivers world wide. The car will increase in value and needs very little expenditure to make race ready. I can still supply parts for this car all from original drawings and body moulds. MYGALE Formula Ford FF200. This is an ex Jamun Racing car which was very competitive in the National British Ecoboost Championship. Chassis no SJ01/08 2012 model which is complete with Scholar Ecoboost engine , Hewland FTR 6 speed sequential Gearbox, Quantum Adjustable Dampers and still retaining Jamun suspension mods. It is for sale with a very large spares package which includes , Side Pods , Undertray, Standard Wings , High Downforce Rear Wing, 2 Car Sets of Wisnbones , Composite Chassis Side Panels , 3 Extra Sets of Wheels and much more. The car has been used for Sprinting since the formula was replaced by British F4 and can also be used for Hill Climbs, Libre Events, Track Day Testing etc. Asking Price for Complete Package £ 14,995. Export Arranged and Finance Available if Required. MYGALE SJ08/09 Duratec. Ex JTR race winning car as driven by Newgarden,Elinas etc. Upgraded to SJ09 bodywork and fitted with 2011 Premier Power motor, JP Hewland LD200 with new CWP. Penske 3 way adjustable shocks, twin shock front,Stack dash and data loger. Car has been rebuilt with a new fuel cell and stainless steel floor and ready to go. Spare wheels, springs and gear ratios available if required. ARGO Built Formula Asia, complete car with 2 litre Ford Zetec engine and Hewland LD200 5 speed box. Full details and photo can be found in Monoposto section. Crossle 62F F/F 1600 Kent. 1986 Car with a known history. Available as a rolling chassis with MK9 Hewland and engine fitting kit. Koni Adjustable shocks etc. Supplied with spare nose, rear beam, wishbones, rockers, radiator.Extra Set Wheels Very clean cost effective Kent club car. MYGALE M12 EcoBoost Formula Ford 2012 Model updated to 2014 spec Car is available either as rolling chassis with Hewland FTR gearbox or complete with Scholar engine and Quantum adjustable shocks. Extra set of wheels included Ideal car for Sprints, Hill Climbs, Formula Libre. Van Diemen Formula Vauxhall Junior, 16 valve model. Complete car with interesting history. See Monoposto section for full details and photo. Mygale M12-SJ EcoBoost. 2012 model updated to 2014 spec. Complete car with Mountune engine, FTR Hewland sequential gear box, Penske 3 way adjustable shocks, 2 extra sets of wheels, alternative gear ratios, Cylinder head overhaul 2 races ago. This car has been professionally maintained to a very high standard from new and is ready to run. ROYALE RP26/27 CHASSIS. Spare chassis with new front baulkhead ( supplied loose ). Ready for shot blast and re-painting. Ideal spare for existing car which would now cost £ 4000 to make new. ROYALE RP27 Formula Ford 2000. 1980, one of only 20 genuine cars built. Complete with Damico tuned motor, Hewland MK9 box, Nitron Adj shocks, Centre post rear wing, Compomotive wheels, slicks and wets, original instruments etc. Very clean car running on the button. Regular competitor in HSCC Historic 2000 event driven by laurence Dene and Derek Watling Competitve car in this popular and expanding series. MYGALE SJ 2000 ZETEC. Ex Mark Taylor / Stephen Kane Professionaly maintained from new. Complete car with Solus Motor, Ohlins Adjustable shocks ( Twin Shock Fronts ) Madin Wheels Magneti Marelli data logger system.Extra Set wheels. Ideal for 750 M/C or Zetec Mono. Easy conversion to Kent F/F 1600. MYGALE SJ 2000 Zetec. Ex Haywood Festival Winner, known history, stored for past 3 years. Complete car with Scholar Motor, 01 body updates, Quantum Adj shocks, PI System 2 data logger, OZ rims, extra set OZ rims, Ceramic wheel bearings and all other Haywood " Tweeks " Running on the button. Ideal car for Formula 4 or conversion to Kent spec. Spares package available as extra. Wishbones,ratios,bodywork etc. MYGALE SJ 07 DURATEC. Ex Championship winning car , not raced this season, now available due to change of plans. Rolling chassis with Quantum Shocks, OZ rims , Data Loger, etc. Very clean car with several new parts fitted. Scholar Motor available as extra if required. MYGALE SJ 03 ZETEC. Successful ZETEC car, little use over last 2 seasons. Complete with Scholar motor, OZ rims , Quantum shocks , Data Loger etc. Ready to go. Now available LESS VAT Excellent car for Formula 4 , Monoposto, or Conversion to KENT spec. MYGALE SJ 08 DURATEC. Cars as currently being run by Jamun Racing and driven by Tim Blanchard, Victor Correa, James Cole. These cars will be available after the Formula Ford Festival in October, to any spec required Deposit Now Will Secure. MYGALE SJ200 Spares I have a selection of good genuine Mygale used parts for MYGALE SJ200 cars. Uprights , Wishbones , Hubs , Suspension Brackets , Bodywork , Madin rims , Hewland LD200 Ratios etc. Can be purchased as individual items or as job lot. VAN DIEMEN DP 06 / 07 Duratec Van Diemen DP 06 updated to 07 spec. Rolling chassis with LD200 Hewland gearbox.Engine fitting kit , OZ wheels Less dampers and data loger, Car has recently been raced in Benelux and now available for sale in UK Clean tidy car ready to fit engine. MYGALE SJ06 DURATEC, Complete car with fresh Scholar motor, Quantum Adj shocks , data loger, OZ wheels. On the button ready to go. Ex Jamun car professionally maintained from new. NOW BACK ON THE MARKET DUE TO OWNERS CHANGE OF PLANS. Spare OZ Wheels also available. MYGALE SJ 06 DURATEC, Ex Jamun car available as rolling chassis with LD200 Hewland,Engine fitting kit. Quantum Adjustable shocks, OZ rims PI dash ( less dataloger) Known history from new. ROYALE RP 21 1976 F/F 1600 I have for sale a Chassis with roll hoop stay , Gearbox cross member , rear suspension mountings, All in good undamaged condition with ORIGINAL CHASSIS PLATE FITTED, Also selection of good used bodywork. Could be the bassis of building up a Classic F / Ford or as spares for exsisting RP 21. MYGALE M-07 F3. Formula 3 as raced by Estaban Guerrieri for Ultimate Motorsport. The car has not been raced since 2007 and used for display purposes. Available less engine , dampers, and Bosch system. Pankel gearbox fitted and engine instalation kit for Mercedes engine. Alternative fitting kits available from Mygale factory. Car comes complete with Spare Nose and front wing assy, rear floor, sundry downforce flaps, wishbones,push rods, exhaust systems etc. MYGALE SJ 10 2010 Duratec, Rolling Chassis less dampers & data loger but with all latest upgrades etc. Choice of 3 cars as raced by Jamun Racing to win 2010 MSA National championship and podium finishes. MYGALE SJ 08/09 Duratec. 2008 car updated to 2009 spec. Rolling chassis less dampers & data loger. Not raced this season and fully rebuilt by professional team to very high standard. Price depending on spec required. SPIRIT SW 06 Duratec. Mountune Engine Hewland LD 200 G.Box Adj. shocks, OZ wheels, etc. Car needs assembly, Will sell to any spec required. MYGALE SJ 06 F/F Duratec. Maintained by Jamun Racing in 06 and not used in 07. Available in a varity of specs. Rolling chassis with or without Quantum adj.Shocks, Data Loger etc. 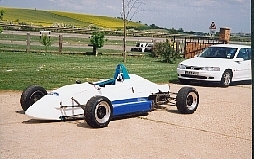 Car is fitted with Blue Printed Hewland LD 200 box and full engine fitting kit. Very Strong Van Rooyen Scholar motor also available. THIS IS THE ONLY ONE OF THESE DOMINENT RACE WINNING MYGALES ON THE MARKET. JAMUN M97 F/F 1600 KENT Purpose built by Jamun Racing to Mark Marchant Kent Festival winning spec. Complete with Greenwood motor, Ohlins adj. shocks, Elliot Tacho, Extra set wheels plus spare tyres. Clean tidy mechanics, bodywork sound. All setup infomation supplied, Parts available from Jamun Racing at sensible prices. MYGALE SJ02 ZETEC 2002 car Complete with Low Milage Scholar Motor and Rebuilt Hewland LD200 ( 5 races only since rebuilds ) Fitted with Quantum/Dynamic adj. shocks C Dash, 2 Extra sets OZ rims with tyres. This car has done little work and is in very good clean tidy condition. Ideal cost effective car for Zetec Scholarship class, Avon Clubmans series or conversion to Formula Four. " Large Spares Package also available as Extra "
VAN DIEMEN RF 98 ZETEC. 1998 Ex Factory car complete with L&P motor, Hewland LD200 box,VERY CLEAN car running on the button. Little use over the last few years ( stored ) Fitted with OZ rims, wide track suspension, Bilstine shocks. 2 extra sets of wheels and some ratio's. Ideal car for club Zetec, Formula 4, Hill climb / Sprint etc. Easy conversion to 2 litre motor. Can also be converted to F/F1600 KENT Spec. MYGALE SJ 2000 ZETEC. 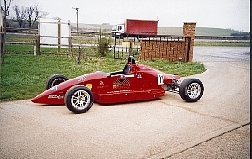 Ex Mike Gardner Racing, complete with Scholar Motor, PDS LD200 Hewland, Quantum Adjustable Shocks, PI System 2, OZ Wheels. 2 Extra Sets of OZ Wheels. WILL SELL COMPLETE OR LESS ENGINE. VAN DIEMEN RF03 ZETEC. Ex Comtech, Camsport car, professionaly maintained to a very high standard from new. The car is in EXCELLENT Condition with brand new nosebox assy and front cover. Only used in 6 meetings during 04 season and stored since Available less engine but with exhaust, oil pipes, starter, motor mounts etc. Fitted with C.Dash, Madin Rims. Bilstine Shocks, Eibach Springs. Plus Extra set of Madins with Wets. Must be seen to be apreciated. 4 Sets Madin Rims, Gear Ratios, Eibach Adjustable Shocks ( Rebuilt ), ECU & Engine Loom also available at extra cost.